A weekly newspaper has been banned by its town’s football club over a story it claimed was “disproportionate” as the string of disputes between club owners and the local press escalates. 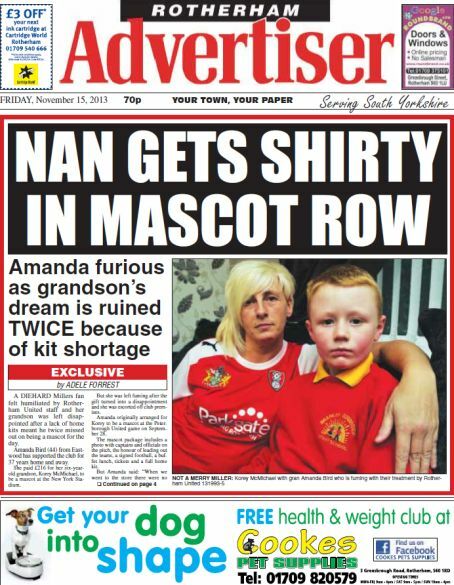 The Rotherham Advertiser published a front page story last week about a kit shortage which prevented a six-year-old being a mascot for Rotherham United. The football club claimed the story was a “complete misrepresentation of our relationship with our supporters” and, following a meeting with the Advertiser, told the paper it would “withdraw the privileged access” enjoyed by the title. The dispute means journalists from the paper will not be able to access press facilities at the New York Stadium and a freelance photographer it uses will also be barred, while the weekly manager’s column will be withdrawn. The move is the latest in a string of disputes between football clubs and regional newspapers, with journalists at the Newcastle Chronicle and its sister titles still banned from press access at St James’ Park following a row with club owner Mike Ashley. Last month, Stoke daily The Sentinel was also hit by a ban by Port Vale Football Club but this was lifted after talks were held. 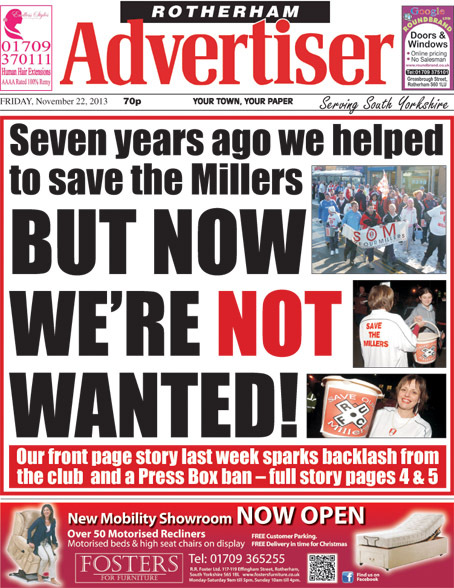 The Advertiser responded to the ban with a strongly worded front page story and inside spread pointing out that it had helped save the club from extinction seven years ago. Editor Andrew Mosley told HTFP that the title would pay for journalists to cover the club’s matches from the stands for the time being but he hoped to resolve the dispute soon. Said Andrew: “We want to resolve it. They are a community club, we are a community paper and we should both be working together for the good of Rotherham. The dispute stemmed from a story about a woman who had booked her six-year-old grandson to be a mascot at a match. However, the club did not have a kit for him and when they rearranged it, they still did not have one, so the woman had got annoyed and ended up being escorted off the premises. Andrew said the club had full right of reply on the story and quotes from it were included. The paper will respond in full to the club’s ban in this week’s paper and it refutes the claim that the article was a misrepresentation of the club’s relationship with its supporters. In a statement on its website, the football club said: “Rotherham United Football Club fully understands and appreciates the presence of press reporting within football both nationally and locally, yet felt it necessary following an article written in last week’s Rotherham Advertiser, to meet yesterday with representatives of the publication. “It is with deepest regret that following the decision to publish such a disproportionate story, the Board of Directors felt there was no alternative but to withdraw the privileged access the Rotherham Advertiser has enjoyed for a number of years. “Rotherham United Football Club work tirelessly within the community and proudly won Community Club of the Year in 2012, with the club currently being recognised by the Football League via its Family Excellence Award and the offending article is a complete misrepresentation of our relationship with our supporters. The Rotherham Advertiser's front page which led to the ban. Given that the lady paid £216 for her grandson to be mascot, and that the club seemingly ruined his day twice, the club deserved front-page exposure in its local papery. It’s hardly a NoW-style ‘expose’ of drug use by the players. For the club to describe its petulant response as “an important point of principle’ makes you wonder what pompous dingbats inhabit its boardroom. Bear in mind their manager Steve Evans comes from the Mike Ashley club of ‘popular people in football’ and it says a lot about Rotherham Utd. Really? That’s a splash? The paper didn’t deserve a ban, but that is a horrible front page. Yes, it’s a story, but P1? Wow. Wow. Rotherham has a football club? Who knew?